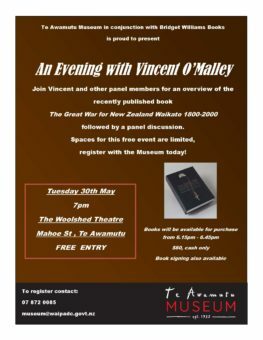 The Te Awamutu Museum is proud to be bringing New Zealand Historian and Author Vincent O’Malley to the Waipa District in May 2017. His most recent publication is The Great War for New Zealand: Waikato 1800-2000. The Museum team is hosting An Evening with Vincent O’Malley on Tuesday 30th May. Vincent will provide an overview of his book, followed by a panel discussion with local participants including Tom Roa, Councillor Susan O’Regan, Alan Hall and Kaawhia Te Muraahi. Copies of the book will be available for purchase at the event ($80, cash only) and Vincent will be available to sign books between 6.15pm-6.45pm before the event. The event is free to attend, although registration is essential. Contact the Museum to register now!